This limited edition release features one of the world's finest conductors conducting the greatest orchestra in the world. It comprises 13 CDs and a single DVD of previously unreleased radio recordings. It is as exceptional as I had hoped. Mariss Jansons, has served as chief conductor of the Royal Concertgebouw Orchestra Amsterdam (RCO) for 11 seasons until 2014/15. These recordings were taken down live for radio broadcast. Jansons has now stepped down from the post for health reasons and will be succeeded by Daniele Gatti from the 2016/2017 season. Jansons is still very much the chief conductor of the Symphonieorchester des Bayerischen Rundfunks an appointment which is being extended until 2021. This anthology has been selected by the same team that compiled the previous box sets. These have drawn on the wealth of recordings in the radio archives dedicated to former chief conductors Willem Mengelberg, Eduard van Beinum, Bernard Haitink and Riccardo Chailly. 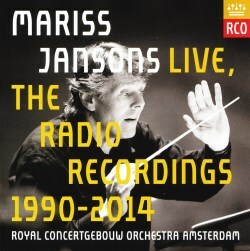 These are now only available as part of the RCO Live Radio Legacy RCO13006. The present live recordings have been taken from NOS/AVRO/RNW at the Concertgebouw, Amsterdam, BBC Radio 3, BBC Proms at Royal Albert Hall, London and RBB/Deutschlandradio Kultur at Philharmonie, Berlin. During my annual visits to the Musikfest Berlin I was actually part of the Philharmonie audience in 2010 and 2012 for performances of four of the works recorded here by the visiting RCO. Undoubtedly this collection of live performances has been well chosen and maintains a standard of excellence. There are a number of works worthy of singling out for their special qualities. On CD 2 Jansons has been a constant champion of Lutosławski’s Concerto for Orchestra. Here he provides an exhilarating reading of this twentieth-century masterwork, that free from the shackles of Soviet music policy, helped make the composer’s name in the West. Recorded at the 2005 BBC Proms Jansons employs a tremendously hard driven energy in thrilling climaxes. He achieves a gleaming sound of vibrant colours without any compromise of unison and intonation. On CD 9 there's a special account of Stravinsky’s Symphony of Psalms, another great twentieth-century work, with the RCO joined by the Rundfunkchor Berlin recorded at the Philharmonie as part of Musikfest Berlin 2012. Jansons demonstrates his adeptness at maintaining forward momentum as well as creating commanding climaxes. The atmospheric effect from the orchestral and choral forces at the opening of the third movement was remarkable. In the final pages there is an understated magnificence with the timpani strokes during the closing measures sounding like a regular heartbeat that could easily represent the fragility of human life. Although he loves opera Jansons is not especially renowned as an opera conductor yet he often programmes orchestral music from Wagner's operas. In Wagner’s Vorspiel und Liebestod the RCO provides exhilarating yet sensitively cohesive playing that capitalises on the ecstatic climaxes and a sweep of near continuous melody. Prokofiev symphonies are not too common in the concert hall with the exception of the Classical and the Symphony No. 5 some distance behind. Recorded in 2014 at the Concertgebouw this heroic Fifth Symphony was written in the midst of the Second World War. Its success re-established Prokofiev’s standing on the international stage also serving to reaffirm his reputation with the Soviet authorities. Scrupulously prepared one feels Jansons has a special affinity for this score and he delivers a riveting performance. The climaxes are adroitly executed by the RCO with tremendous bite from the brass, the woodwind excelling and the unified string section highly expressive. Satisfyingly filmed at the Concertgebouw in December 2014 the single DVD is the performance of Mahler’s Symphony No. 4 with soprano soloist Anna Prohaska. With such beautiful playing Jansons’ reading is dependably fresh and absorbs Mahler’s bucolic mood-swings quite splendidly. Prohaska is a satisfying soloist who sounds both assured and engaging. The principal horn excels throughout as does the admirable woodwind section which is kept extremely busy. Clearly the Concertgebouw audience enjoyed this performance and gave a standing ovation bringing back Jansons and Prohaska time after time. Recorded over a twenty-four year period it is pleasing to report a satisfying consistency across all these live recordings. The first class clarity, presence and balance is testimony to the specialist expertise of these radio broadcast engineers. Applause has been kept at the conclusion of all of these live performances which is included in the timings. Sadly at the conclusion of Bruckner Symphony No. 3 amongst the applause an errant 'yeller' rather spoils the afterglow. Often these types of compilation can be mixed bags but this is a stunning collection of previously unavailable live performances. There is not a single dud in a collection that shrewdly mixes mainly core repertoire with a number of contemporary works. This desirable, high-end set displays the elevated standards of performance excellence we have come to expect from the Royal Concertgebouw Orchestra under Mariss Jansons.